Underdog has designed several CD ROMs for Transnet via Converse, as part of Transnet’s “turnaround” plan. 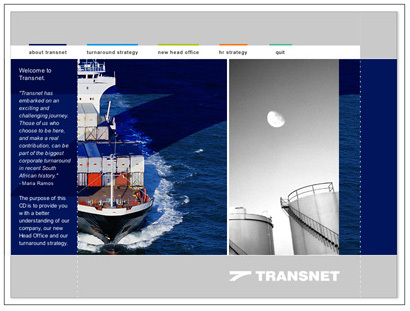 The CD’s included the original Staff Induction CD, which included Underdog shooting and editing video interviews with all Transnet’s senior executives for the CD. This CD was created in Macromedia Director and was then distributed widely to all senior Transnet Employees across all Transnet divisions. A FLASH CD was also created to illustrate the new staff incentive scheme using animated characters and a “game” matrix to illustrate the way in which the new incentive scheme works.